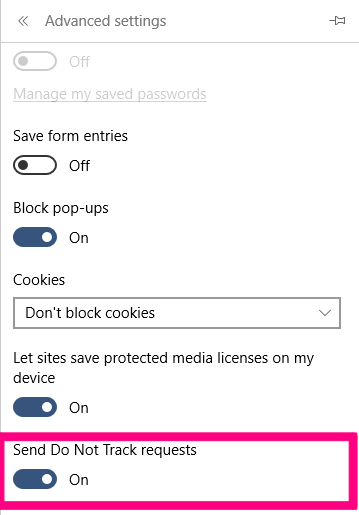 For private browsing, users of Microsoft Edge may want to enable the Send Do Not Track request option in their browser settings menu. This offers protection against tracking from third party websites. 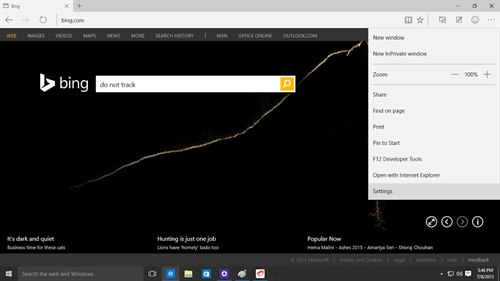 According to Microsoft's new Do Not Track approach, tracking protection is OFF by default. But before we see how you can enable this option, let us see what tracking really means. Many third party websites, advertisers, content providers and others find out how you interact with websites by tracking your activity. They may be able to keep track of the websites you visit, the products you buy, the links you click and other data. Not all of this data is misused. Websites use such information to offer you better browsing experiences, such as more relevant recommendations and personalized ads. But if you are worried about your browsing activity not being private - and often shared with other companies - then you can prevent others from tracking your activity. How does the Do Not Track request work? When you enable tracking protection, your browser prevents your browsing data from being sent to websites that you visit, or it blocks content from these websites for your protection. Your browsing activity is kept more private. Tracking Protection has been around since Internet Explorer 10, and it was welcomed by most users. However, according to a recent update published on the Microsoft blog (an update on Microsoft's approach to do not track), they are changing their approach to tracking protection. 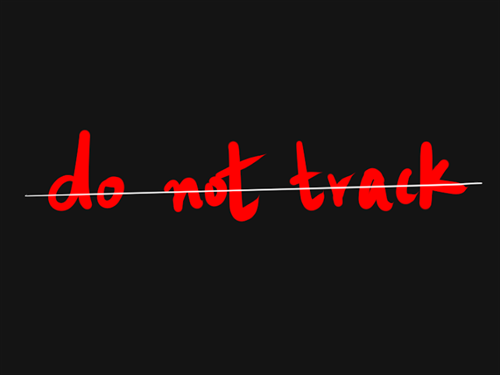 Do Not Track will not be enabled by default. You will have to manually enable it from the Settings menu. This is because Microsoft is seeing tracking preference as a deliberate choice on the part of the user. If you don't make a choice, it means you don't have a tracking preference, and your tracking protection is off. Microsoft believes that every browser vendor should let their customers know their options, and show them how to change the settings. The rest is up to the customers. So, if you decide that you don't want third party content providers to track how you browse the web, then go ahead and enable the 'Send Do Not Track request' option available to you on Microsoft Edge. Follow the steps below to do this. You can find the Settings sidebar by hitting the More Actions (...) icon at the top right corner of your Edge browser. Scroll down to the last option, which is Settings, and select it. Scroll down to the bottom of the Settings menu to find the View Advanced Settings option. Select it. Scroll down the Advanced Settings menu to find the Send Do Not Track requests option. You will find it under the Privacy heading. It will be toggled OFF by default. Hit it again to toggle ON. This will enable tracking protection and keep your browsing activity private.